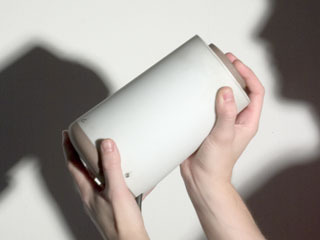 The audio shaker explores our perceptual understanding of sound. Anything sung, spoken, clapped, whistled or played near it is trapped inside, where it takes on an imagined yet tangible physicality. Sounds caught in this void are transformed, given weight and permanence, reacting directly to the shaker's movements, subtle or violent. Shaken sounds have to settle down before becoming still and silent, behaving more like fluid than transient energy.